One of the biggest names in the OPM scene, Neocolours, makes its long-awaited comeback with the release of the single "Giliw,” 19 years after their last recorded release. The brand-new song, written by Jimmy Antiporda, exemplifies the sound that they've been famous for -- well crafted musical performance that would bring an emotional impact to their long time listeners and a growing new generation of listeners. “Giliw” is now available digitally on iTunes, Apple Music, Deezer, Amazon and Spotify under Universal Records. 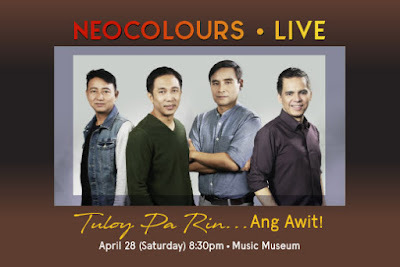 Neocolours' songs have been a mainstay of many Filipino listeners’ playlists. Their songs such as ‘Maybe,’ ‘Kasalanan Ko Ba,’ ‘Hold On,’ ‘Say You'll Never Go’ and ‘Tuloy Pa Rin’ have transcended generational barriers, and are repeatedly re-recorded by some of the country's top recording artists such as Erik Santos, Kyla, Noel Cabangon, and Nyoy Volante to name a few. On top of this, their hits have a combined listenership of close to 10 million streams on Spotify. Aside from the completion of a new album in 2018, Neocolours' other music activities includes a 30th year anniversary show “Tuloy Pa Win…And Awit" at the Music Museum on April 28, as well as a national tour for the rest of the year. Neocolours are composed of Ito Rapadas (Vocalist), Jimmy Antiporda (Keyboards), Jack Rufo (Lead Guitar), Paku Herrera (Bass Guitar) and Nino Regalado (Drums).